Kevin Daniel is known for his realistic wildlife scenes. 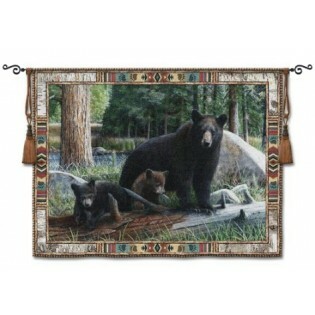 In this New Discoveries Bear Wall Hanging, two black bear cubs are trying to explore their new world. Kevin Daniel is known for his realistic wildlife scenes. 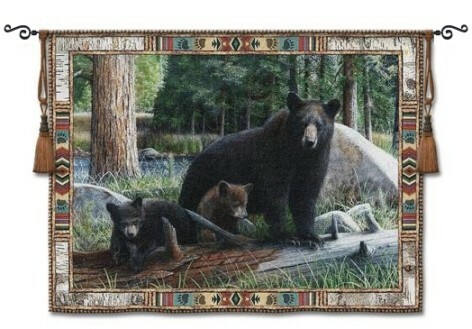 In this New Discoveries Bear Wall Hanging, two black bear cubs are trying to explore their new world. A rustic bark and Indian print border frame this rustic wildlife tapestry. Medium tapestry measures 53" x 36"